Many words in English language have more than 1 meaning. For some students with severe language disorders, the ability to learn a limited number of vocabulary words for a larger number of contexts is an advantage. For others with less severe language disorders, this can be confusing. Reading comprehension can be impacted by inability to understand word meanings. Students with language disorders often lack flexibility of vocabulary comprehension and use, which can have an impact on reading comprehension, understanding of slang and idiomatic speech. 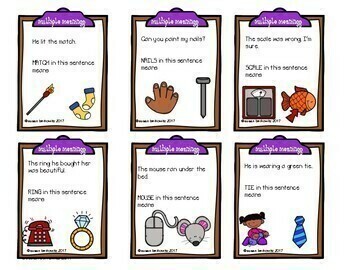 Comprehension of multiple meaning words is an achor skill for vocabulary in the CCSS. 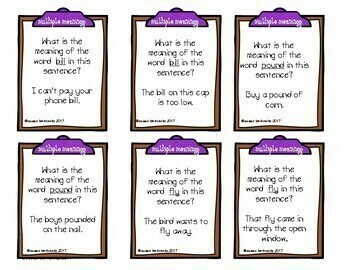 • Some ask students to provide 2 meanings for a given word. • Others ask for the meaning of a given word in a specific sentence. 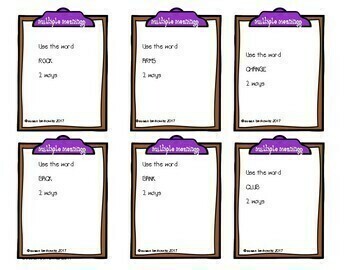 • Others ask students to use the word in 2 different ways, to show the two (or 2 of the) meanings. 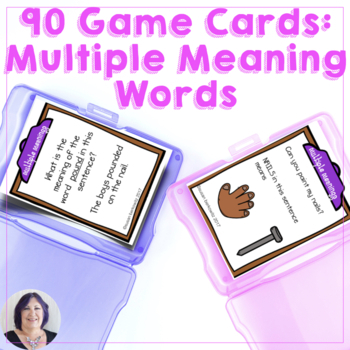 • There are 12 additional game cards that ask how a word is used in a specific sentence; and offers multiple choice pictures for responding. • There is a game board to use. If you are working with mixed groups of students, you might want to purchase my bundle of Game Cards for Language so you can target all skills in one game!